Do you miss the food of your childhood? If you grew up in the 70’s, your mom balanced her culinary skills with the convenience foods of the future, and you licked your lips for a second helping of snacks and meals. Here are 10 70’s food trends that’ll bring you right back to being a kid. Food nostalgia is a real thing. The comfort foods of our childhood bring back vivid memories when tasted again as an adult. If you grew up in the 1970s, you have a lot to remember! The decade of Watergate, Star Wars, and All in the Family had its own interesting food trends. Do you miss the era of polyester? You’re in luck because some quirky 70’s food is trending again! Below you’ll find 10 70’s food trends that take you right back to your childhood. Read on to travel back in time! Quiche is perhaps the food most often associated with the 1970’s. The quiche fad began with quiche Lorraine, a delicious combination of bacon, Swiss cheese, and eggs. From there, the trend exploded. The 1970’s jet-set saw quiche as a little bit French and quite sophisticated. It was the ideal food for ladies who lunch and anyone else who wanted to appear cosmopolitan. The quiche trend died an abrupt death, though, with the 1982 publication of the humorous book “Real Men Don’t Eat Quiche.” Luckily for us, quiche is popular again today. Sometimes, though, you find modern twists, as in this paleo version of quiche Lorraine. Hawaiian-inspired food was all the rage in the 1970’s. In fact, all you had to do was add pineapple to a recipe, and you were cool. Bringing pineapple and chicken together, then, gives your meal a Hawaiian flair while combining sweet and savory tastes. Today, foods inspired by Hawaiian culture are back in style. The island’s cuisine combines healthy, vegetable-based dishes with some honestly tacky ones. It’s this combination of qualities that are inspiring to today’s chefs. All you have to do, then, is making a quick visit to your local poke restaurant to relive Hawaiian flavors (and your childhood!) once again. Carrot cakes were frequently made during World War II. Sugar was rationed, and housewives used carrots to make up for this loss. Fast-forward to the 1970’s, and we find carrots being used in cakes once again. This time, home cooks included them in their cake recipes because they thought to add carrots made their cakes healthier. Face it. When many of us think of the 1970’s, most of us imagine unhealthy convenience foods (Hamburger Helper, anyone?). But, then there’s pasta primavera. Created at the famed NY restaurant La Cirque in the mid-70’s, it remains the shining example of what was called Nouvelle Cuisine. Featuring fresh ingredients and a creative presentation, it influences the way we eat even today! Koogle and Mug-o-Lunch aside, there were people trying to eat healthy foods in the 70’s. Vegetarianism was a growing trend, and a big, green salad topped with green goddess dressing was the hippie’s meal of choice. Hippies notwithstanding, green goddess dressing is still popular today. You can use it over salads, as a dip, or even a marinade. Dip your carrot into a bowl of this dressing for a trip down memory lane. In the 1970’s, it wasn’t a party unless you had a cheese log or a cheese ball. Why were they one of the big 70’s food trends? It’s because they were so versatile. You could make them out of almost anything (as long as you included cheese). They could also be shaped into any form. Today, they are again a trendy party food. Part kitsch, part easy party dish, they are truly nostalgic food. Like quiche, crepes were an extremely popular 1970’s dish. They offered the average person an inexpensive way to feel chic and European. Even though many creperies were located in malls, they were decorated with country French decor. 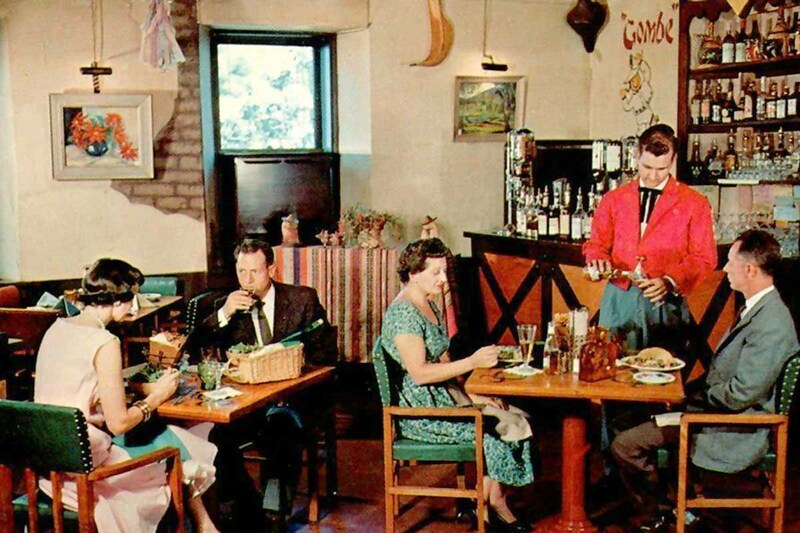 Many diners felt like they were transported directly to a small European village! Today, crepes are popular once again. Even celebrities are enjoying them! And then there’s fondue. It was imported from Switzerland and became the party food of both the 1960’s and 1970’s. Fondue was fashionable because it was inexpensive and easy party fare. All you had to do was melt some cheese, cut up your dipping pieces, and voila! you were ready to boogie. Happily, for cheese lovers everywhere, fondue is making a comeback. Not only is it the ultimate 70’s party food but also the ideal comfort food. That warm, gooey cheese is sure to bring back many childhood memories. What 70’s childhood was complete without deviled eggs? They were set out at every family get-together and eaten with abandon. Not only did they taste good, but they were easy to prepare. Just boil some eggs, scoop out the yolk, mix with mayonnaise, and put it all back in the egg for a tasty finger food. Both traditional and more innovative deviled eggs are popular once again. Not only do they evoke childhood memories. They can also be dressed up with tasty additional ingredients like chives, bacon, or, of course, the ever-popular, Sriracha. Like carrot cake, zucchini bread was considered a healthier alternative to other pieces of bread during the 1960’s and 1970’s. Although not invented by hippies, it was associated with their movement (think also of granola!). It quickly went mainstream, though, and housewives all over America were making it. Today, zucchini bread is popular again. Many home cooks add chocolate and other treats. Maybe these additions make zucchini bread less healthy, but it’s delicious nonetheless! Did these food items make your mouth water? Does this 70’s food remind you of your childhood? Maybe this article inspired you to make some of these recipes again. It’s fun turning the clock back! And, it’s easy to discover more fun tidbits about your youth. If you enjoyed this article, why not check out some of our other ones? We have topics as varied as how to “Stay Healthy & Be Active” and “Beautiful Photography.” Something is bound to be of interest to you!